Professionals know that sweeping compound is an absolute must for safe and effective cleaning. 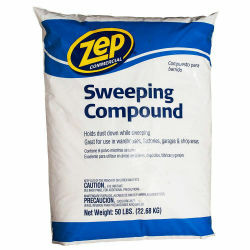 Zep Commercial Floor Sweeping Compound holds down dust to enhance effectiveness and reduce the risk of inhalation. The non-toxic, oil-based formula leaves no residue behind and is perfect for use in warehouses, stores, garages, and other facilities. Apply Sweeping Compound by lightly sprinkling a small amount on the floor. It is not necessary to cover the entire floor area with compound. Sweep the floor immediately. Do not walk on the compound or leave it on the floor for extended periods. Handling and Storage: Avoid contact with eyes. Avoid breathing dust. Do not use with other products. Use with adequate ventilation. Wash thoroughly after handling. Observe label precautions. Keep away from heat, sparks and flame. Keep container tightly closed. Keep container in a cool, well-ventilated area. Keep out of the reach of children. Key Ingredients: Cellulose (Absorbent); Hydrotreated Heavy Alkanes (Dedust Oil); Silicon Dioxide (Anticaking Agent); Chromatint Red 1764 (Colorant).